So I cooked by 5th batch today. Still working with the master dough. 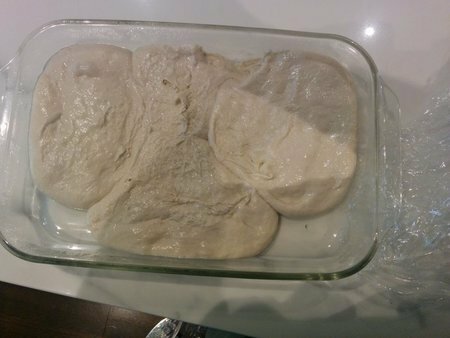 When I took the dough out of the fridge to cook it today, It looked something like the photo after leaving it out for 2 hrs. Same thing happened with the 4th batch (when i took the photo). The dough was still good but i'm scratching my head with what went wrong. I cooked my pizza on the bbq today since it's a nice day (for canada :P) it turned out amazingly well considering i burned the olive oil i put on the iron pizza plate i got. kept the temp somewhere between 600 and 700 which made the crust amazingly crisp compared to what I make in the oven. Just to make sure we have the proper back story, were these separate balls that didn't hold their shape during the fermentation process? First, doublecheck measurements. Is there too much water in your dough? Or maybe not enough flour? Second, I wonder if it's related to balling. Do you have any "before" pics? Gil, could you post your formula and mixing procedure? That'll help us get a better understanding. I know exactly where I screwed up, I added all the water at once and added extra when it said to add the two tablespoons. That'll do it! Glad you were able to pinpoint the issue. There's a few things you should be going for. 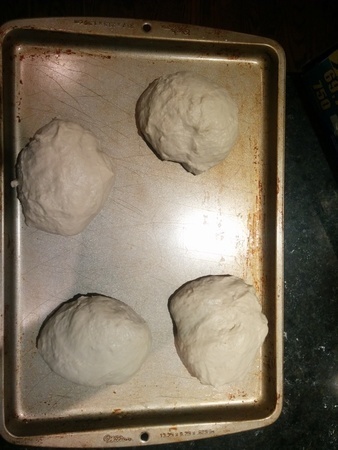 First, as you tuck the dough into the bottom, you smooth out the top and naturally form a smooth, round ball. And second, you want the bottom tightly sealed and smooth. This means you'll pinch the bottom and then roll it around on a surface if you think it needs to be smoothed out. Properly balling your dough helps ensure that you'll get a nice round and consistent shape when you open your dough. Do an hour bench rest after you mixed the dough, no mater what. It helps immensely with settling the dough down. Then ball it up and prepare for whatever bulk rise you have in mind. The result will be a much better gluten structure and crust characteristics. Great point Mike. The resting periods do wonder in terms of workability. Dough balls are smoother and are much easier to form into balls. "Mike's suggestion for allowing the flour to hydrate for an hour may be a bit on the long side--most books state that the magic number is 20 minutes for flour to hydrate..."
Ken, you're referring to an autolyse, if I'm not mistaken. 60 mins will do wonders to the dough. TG even suggested to me to try a 5-hr autolyse which I did and the outcome was phenomenal. The hour I suggested in my previous post above was for the bench rest, not to hydrate the flour. The dough's already mixed and out of the mixer when bench resting. . . . . . . Oh well, the hydration was enough based on the book, gonna try it the other way next batch. Made half the dough on the bbq on a 1/4 inch thick round steel plate, rolled the dough out paper thin and with the bbq set on high (700 degrees) then topped with truffle oil. it turned out great with a totally different flavor profile than making it in the oven. Mixing it by hand might also give me a bit of a different result thanks to some of it sticking. As for bench rest after i mix it all together, that shouldn't be a problem, should i put a towel or something on the dough so it doesn't dry out too much?? Made two Calzones for dinner on the BBQ. The technique was sloppy but didn't really expect picture perfect on my first time. The bottom was almost black but the top was almost perfect. It didn't puff up, looked more like a deflated football. Next time i need to raise the cooking surface up to take advantage of the radiant heat the bbq produces. 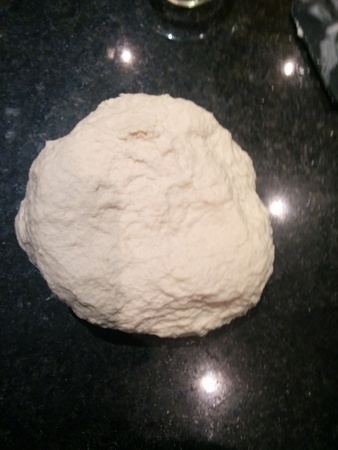 So on my 10th batch, i took my dough out of the fridge 45 mins before i was going to cook it and found this (the photo below) this is the master without starter so i let it rest for an hour before i put it away for 30 hrs of batch fermentation. I weighted out my dough and made it into nice balls. There's definitely not enough space in that tray / container Gil. I'd say there's enough room one ball, possibly two. Try one ball in that tray next time and see how it turns out. 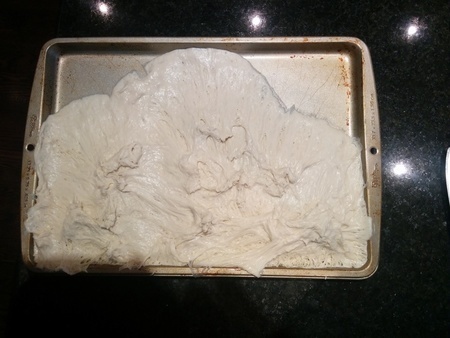 It also looks like the top of the dough balls were disturbed. Did this happen when you removed the plastic wrap? One other thought, and I'm not sure how much of a difference this will make, but try using a plastic container instead of glass. I've heard of people having trouble with dough sticking when it comes to glass. In your previous post (6th batch), you used a metal baking sheet. That looks like a good size for three balls of dough. You might give that a try. Also, if you're using plastic wrap, remove the wrap immediately after removing it from the refrigerator, otherwise you'll have issues once the dough comes to temperature.